Well, dear reader, those who have followed me for a while may be aware that I've been writing a book, hence why my blog has not been quite so active as normal. I put the first 15 chapters on Authonomy, a writing website set up by HarperCollins to help new writers get published, to see whether people thought it was any good or not. The general consensus was that yes, it was actually rather good. With the help of some of the very talented writers on Authonomy, I received lots of really good help and advice and the book, currently called La Vie en Rosé, regularly featured in the top rated books of the week. In fact of the 300 or so people who read it, only one person didn't like it. But then he thought he was The New Messiah so I wasn't particularly bothered. A couple of months ago I was contacted by the Commissioning Editor of Summersdale Publishing, a great indie publisher, who uttered those immortal words, 'are you looking for a publisher?' Are frogs green? Is the Pope a Catholic? Are the Kennedys gun shy? Do bears sh..... you get the picture. To cut a short story even shorter, I sent her the 20 plus chapters I had written, she loved them and, fortunately, so did her colleagues and they have offered me a deal to publish it. Me! 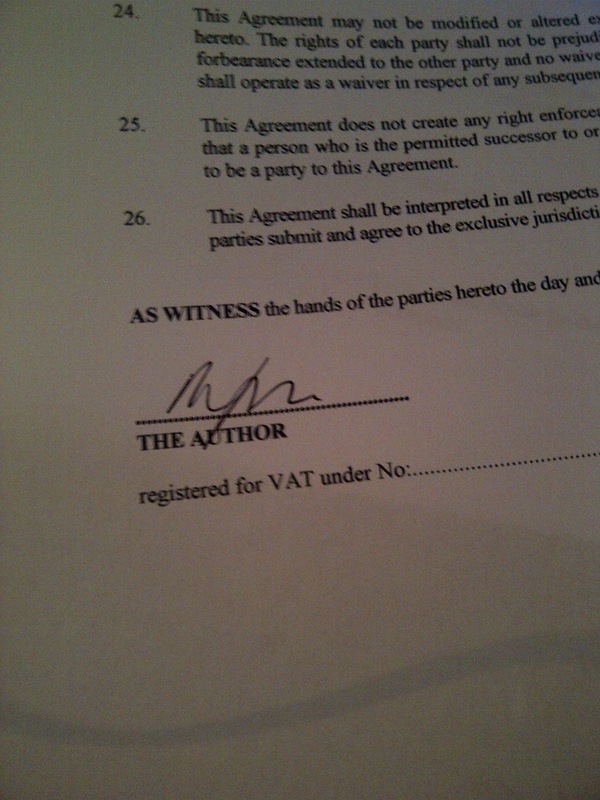 Yes, I have a book deal. JK Rowling has nothing to worry about and I certainly won't be giving up my day job but how bloody fantastic is that? I'm going to be published. Next summer, La Vie en Rosé (although it won't be called that as there is already a book with the same title) will be on the shelf of your local Waterstones. I sort of feel a bit of a fraud because I've never so much as received a rejection slip. In fact, apart from Summersdale, I've never even sent it out to anyone. It shouldn't be this easy, surely. How can I be a starving writer slaving away in the garret with just a bowl of chicken bones and water to keep me going when the first publisher who contacts me wants to publish my book? It all feels a little surreal. Now the embarrasing bit. I have to build an internet presence ready for when it does finally make the bookshops. I've resurrected an old blog I started called The Accidental Author where you can share my publishing journey and if you are on Facebook you can 'like' my Author page complete with hideous photo. So there you have it. My Exciting News. Now, I have to have the manuscript in by December 15th so it's back to Chapter 29 for me. Be back soon. Looking forward to next year then - and looking to have my copy signed, s'il vous plait! Brilliant news! So delighted for you. Summersdale are the publishers of Ben Hatch's book, 'Are we Nearly There Yet' which I adored. I think their books are fantastic; niche travel stories. In fact I had always thought that if I were ever to try and turn my family diaries into some kind of book, I would approach them. Congratulations - I will go straight to Authonomy and have a look. Well, what wonderful news indeed. Perhaps with Authonomy you no longer need to send out your ms as publishers know where to look to find new authors and can just contact the ones they like. Much more efficient really. Will you need an agent though too? Thanks all very much. I'll keep you all posted. BacktoBodrun, unfortunately it's no longer there. 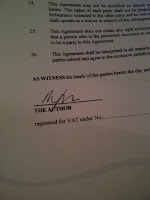 Once the contract was signed I had to take it down from Authonomy. Look out for the real version!